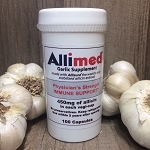 Allimed is a garlic supplement made with Allisure, the best stabilized allicin extract. Allimed is our strongest allicin product! Each Allimed vegi-cap contains 450 mg of allicin, which is suitable for vegans and vegetarians. Allicin is created when the alliinase enzyme in garlic interacts with alliin causing a chemical reaction that produces allicin; garlic's biting taste and aroma is also the result of this process. The resultant compound is inherently unstable and will quickly degrades into various sulfur-containing compounds. Our Allimed contains stabilized bioabsorbable allicin that will survive the digestive process to become available when most capable of being absorbed by the body. So thankful for this product. Has helped so much with my inflamation. Rarely get sick anymore. Gonna double up since the storms coming. Thank you for offering the best discounts on Allimed. My husband and I use these capsules a LOT. It keeps us from getting sick and it doesn't make our skin or breath stink. I have family members who have used it for more serious issues as well with surprising success. It's like the best kept secret that I hope more people will find out about!